There where instructions on the site requesting that you not publicly release your submissions until the judges had finished doing their judge thing and as far as I can tell the winners still don’t seem to have been selected. But its been closed for submissions for a relatively long time now and I just realized that it seems like all of the games have already gotten coverage on a bunch of homebrew news sites. So screw the waiting. Anyways this was my submission for the 2010 Pandora Angst Coding Competition. 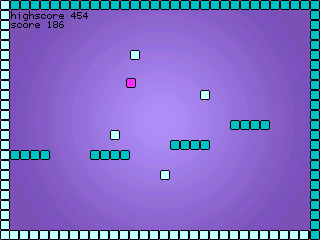 Its a simple score based platformer with constant forward motion. Originally I was going to do something else that a little bit less overly simplistic/lame but I got annoyed with that. So I made this instead with the idea that I would be able to throw it together in an afternoon. I actually ended up spending a lot some time on it though. Mostly I just got stuck on simple and stupid crap like different transitional effects that I ended up abandoning and how to best handle the collisions (which after a few days I ended up pretty much just copying / adapting how I did it for the woefully still incomplete TimeFrack 2D). The audio is probable set a little too loud (I never got around to making it adjustable so you just have to deal with that) but I really like the stuff I was able to find at the Free Sound Project so personally I’m cool with it being a bit too loud lol. Even though it is in no way complex or impressive in its game play design, tech or even sprite art I’m actually really freaken happy with how it turned out. Its fun in a zone out and try to beat the high score’ kinda way and its short bursts of gameplay are ideal for a portable platform like GP2X. Plus it just feels (at least to me) very complete. It has a goal and a failure conditions and there are no half implemented features. Its not a great game but it is a complete game which is something that I don’t actually succeed in making very often. So download it try it and let me know how high you manage to score. I’m still totally planning to do a quick port of this and bring it over to Wii but I’m getting sidetracked by another Wii project that I had been putting off for even longer.